The following are the latest results contributed by HM Courts Service, for cases sentenced by West Sussex Magistrates’ Court sitting at Worthing from April 6 to 12. Connor Pragnell, 23, of St Blaises Road, Boxgrove, was given a community order and must carry out 80 hours’ unpaid work after admitting drug-driving (7.0ug/l Delta-9-THC) in Chichester Road, Chichester, on January 24, 2018; possessing herbal cannabis in Chichester on January 24, 2018; and three charges of drug-driving (3.4ug/l Delta-9-THC, 32ug/l cocaine, 200ug/l benzoylecgonine) in Drayton Lane, Chichester, on February 26, 2018. He must pay £85 victim surcharge, £85 costs, and was disqualified from driving for 24 months. Manuel Silva, 62, of Aspen Way, Bognor Regis, was fined £133 and must pay £30 victim surcharge, £85 costs, after admitting driving over 60mph on the A24 Dial Post on July 18, 2017. Kelly Alderton, 28, of Bury Common, Bury, was fined £68 and must pay £30 victim surcharge, £85 costs, after admitting driving over 30mph in London Road, Coldwaltham, on July 11, 2017. Her driving record was endorsed with four points. Ben Haining, 39, of Radnor Raod, Worthing, was fined £100 and must pay £30 victim surcharge, £127 costs, after being found guilty of fishing without a licence at Mill Farm Fishery, Pulborough, on July 23, 2017. Kate Simpson, 39, of Wellers Close, Felpham, was fined £377 and must pay £38 victim surcharge, £85 costs, after admitting driving over 60mph on the A24 Shipley on June 21, 2017. His driving record was endorsed with three points. Ben Foster, 29, c/o Heron Close, Lavant, was given a community order with Rehabilitation Activity Requirement and must pay a total of £350 compensation, £85 costs, after admitting assault by beating in Chichester on December 20, 2017; and destroying a window worth £750 at McDonalds, Chichester, on December 20, 2017. Jane Young, 47, c/o Felpham Way, Bognor Regis, was given a community order with Drug Rehabilitation Requirement and Rehabilitation Activity Requirement after admitting stealing goods worth £85 from Boots, Chichester, on October 30, 2016; stealing goods worth £62.50 from Boots, Chichester, on November 23, 2016; and stealing goods worth £93 from Boots, Chichester, on October 15, 2017. She must pay a total of £340.50 compensation, £85 costs. Kevin Brown, 35, of Stanbrok Close, Bognor Regis, was given a community order with Rehabilitation Activity Requirement and fined £250 after admitting assault by beating in Bognor Regis on March 1, 2018. He must pay £85 victim surcharge, £85 costs. Charley Conrad, 31, of Hawthorn Road, Bognor Regis, was given a community order with three-month curfew, electronically monitored, from 7pm to 7am, and Rehabilitation Activity Requirement after admitting making threats in a voicemail message and further threats in a Whatsapp message, causing fear of violence, in Bognor Regis between January 10, 2018, and January 13, 2018. She was also given a restraining order and must pay £85 victim surcharge, £85 costs. Les Kelly, 57, of Central Road, Fareham, was given a community order with Rehabilitation Activity Requirement and must carry out 140 hours’ unpaid work after being found guilty of racially-aggravated assault in Chichester on May 8, 2017. He must pay £150 compensation, £85 victim surcharge, £85 costs. Pavel Boaghe, 34, of Collyer Avenue, Bognor Regis, was fined £415 and must pay £41 victim surcharge, £85 costs, after admitting drink-driving (60mg of alcohol in 100ml of breath) in Linden Road, Bognor Regis, on March 24, 2018. He was disqualified from driving for 17 months. He was discharged conditionally for 12 months after admitting possessing cocaine in Linden Road, Bognor Regis, on March 24, 2018. He also admitted driving without the correct licence, no separate penalty. Richard Davies, 30, of Charles Cobb Gardens, Croydon, was fined £153 and must pay £30 victim surcharge, £85 costs, after admitting being drunk and disorderly at Robin Hood public house, Shripney, on March 26, 2018. He also admitted breaching a suspended sentence order, which was varied to include an additional ten hours’ unpaid work (total now 70 hours). Jack Hemmings, 25, c/o The Oaks, Bursledon, was discharged conditionally for 12 months and must pay £180 compensation after admitting stealing fuel in Bognor Regis on February 25, 2018. Trevor Rogers, 47, of Spiro Close, Pulborough, was fined £429 and must pay £42 victim surcharge, £85 costs, after admitting drink-driving (65mg of alcohol in 100ml of breath) in Stane Street Close, Pulborough, on February 25, 2018. He was disqualified from driving for 20 months. He fined £429 after admitting driving without insurance and admitted driving without the correct licence, no separate penalty. Julie Savage, 56, of Holdenhurst Road, Bournemouth, was fined £207 and must pay £30 victim surcharge, £85 costs, after admitting failing to provide a specimen of breath when required in Bognor Regis on March 26, 2018. Her driving licence was endorsed with ten points. Charlotte Crossan, 35, of Bonham Road, Bognor Regis, was given a community order with Rehabilitation Activity Requirement after admitting drink-driving (97mg of alcohol in 100ml of breath) in Wrotham Heath, Sevenoaks, on March 6, 2018. She must pay £85 victim surcharge, £85 costs, and was disqualified from driving for 24 months. Edgaras Muliuolis, 37, of Mill Park Road, Bognor Regis, was discharged conditionally for 12 months and must pay £20 victim surcharge, £85 costs, after admitting stealing Ariel washing tabs worth £5 from Poundland, Bognor Regis, on March 26, 2018. Nikolai Claus, 30, of Meadow Close, Ash Vale, was fined £230 and must pay £30 victim surcharge, £85 costs, after admitting drug-driving (233 benzoylecgonine) in Stockbridge Road, Chichester, on January 1, 2018. He also admitted drug-driving (3.8ug/l Delta-9-THC) in Stockbridge Road, Chichester, on January 1, 2018, no separate penalty. He was disqualified from driving for 14 months. Cain Dugdale, 21, of Bridgewater Close, Billingshurst, was discharged conditionally for 12 months and must pay £50 compensation, £20 victim surcharge, £85 costs, after admitting assault by beating in Storrington on December 22, 2017. Bruno Lopes-Figueiredo, 38, of New Road, Littlehampton, was fined £666 and must pay £66 victim surcharge, £85 costs, after being found guilty of driving without due care and attention on the A27 Chichester on November 7, 2017. His driving record was endorsed with seven points. 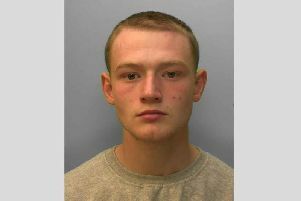 Callum Wallace, 21, of Pearson Road, Arundel, was discharged conditionally for six months and must pay £20 victim surcharge, £85 costs, after admitting using threatening or abusive words or behaviour likely to cause harassment, alarm or distress in Chichester on December 11, 2017.